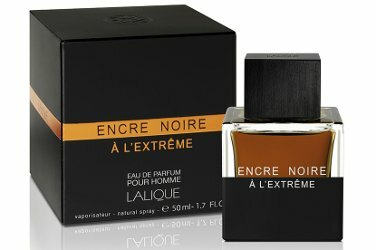 Lalique will launch Encre Noire À L'Extrême, a new flanker to 2006's Encre Noire. Encre Noire À L'Extrême follows 2013's Encre Noire Sport. The notes include grapefruit, bergamot, cypress, lavender, aquatic accord, nutmeg, vetiver, cashmere wood and musks. 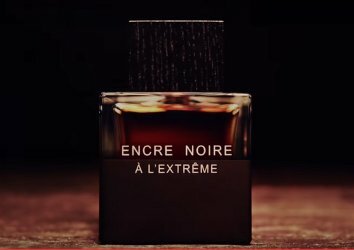 Lalique Encre Noire À L'Extrême will be available in 50 ($105) and 100 ($139) ml Eau de Parfum. Another update: I suspect the notes above are incorrect, although they're from the Lalique website. Here is the description from Diary Directory — "Created by perfumer Nathalie Lorson, it is based on two qualities of vetiver, one from Haiti, the other from Java. Bergamot blends with the woody, aromatic freshness of cypress and smooth elemi, while iris wraps the vetiver accord. A dry-down of sandalwood and patchouli are combined with balsamic benzoin at the base." I’m not a fan of vetiver, but Encre Noire managed to become a favorite. This just went strait to my “must find” list. They had me until the aquatic note thing……. Oh dear! I read quickly and did not see that… Reminder to self: Thy must try before reaching for thine credit card! I want to smell it, but switching an aquatic accord for blackberry makes me hesitant. I will still try it, but the mere mention of that has already ruined it for me. I still think that might be a mistake, I will keep an eye out. It is not for sale on their website yet, just listed there. Looks like a small bottle of bourbon! Encre Noir is terrific and has good sillage and strength as it is, so I guess I won’t be too disappointed if this version does not turn out to be any good. Hi Robin, I’m with you. The aquatic note ruined my excitement. I wear the original routinely all year around and I will gladly stick with that. Too bad because I would have picked this new flanker up immediately unsniffed if there had been no mention of an aquatic note. I imagine someone out there loves aquatics as the industry is flooded with them, luckily I am not one of them! I was wondering if this was the same as the eau de parfum version they had released in the pricey Lalique crystal bottle…. but since it mentions the aquatic notes, I doubt it. I got this version a couple of years ago. The edp was a smoother version of the edt, still recognizably Encre Noire. It should have been more accessibly released. I agree the EDP is pricey but Neiman Marcus on its website has had it 50% off and it comes with a candle and shower gel and it is as good as the EDT???? Aquatic doesn’t scare me in the least! So I am all about this!!!!!! Robin I was not sure I even wanted to smell EN Sport, and then I did. I can tell you it’s the best of what you can imagine and not sporty at all. Thanks — will keep that in mind if I ever see it!